It's Walky! » Thanks, Steven. Steven??? I spell Beef’s given name with a V instead of a PH??? Huh. Anyway, parents, please do not pick favorites among your children. They might secretly team up with British martial artists stranded from an alternate dimension and punch somebody into a floor. With twins it’s not a matter of favorites, but a control group. I guess you could say Stephen had a…beef to settle. I always simultaneously hated and loved this turn. Because it totally makes sense but it’s also only barely foreshadowed. If only Linda didn’t start ignoring him when Sal showed up in her life Beef wouldn’t have become a turncoat. Yeah, the panel with Beef looking back at his bio-parents’ graves is great, but it gets most of its power on rereading. Oh hey what do you know Linda is a crap mother in this Universe too. Remember everyone, favoritism leads to Britjas. You know, it’s pretty disconcerting when you’re only half woken up and are scrolling through your RSS feeds and the title of one of them is seemingly thanking you personally for some reason. Thankfully it turns out I just share my name with a traitor/disgruntled son (depending on your viewpoint), so that’s better. 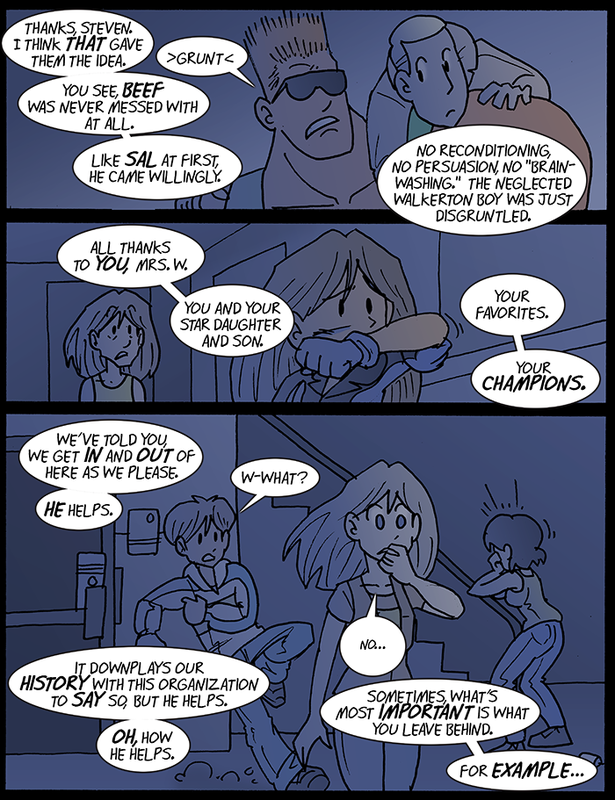 I never really viewed Beef as a Steven, more of a Duke Nukem… Thanks to that first panel.